Black and white photographs, drawings and prints are featured in "Kent Rush: Photo-Syntax," which shows in Griffith Gallery on the SFA campus Jan. 20 through March 10. NACOGDOCHES, Texas - The work of artist Kent Rush will be showcased in an exhibition that displays Jan. 20 through March 10 in Griffith Gallery on the Stephen F. Austin State University campus. 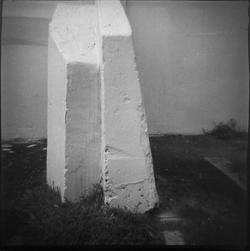 Black and white photographs, drawings and prints are featured in "Kent Rush: Photo-Syntax," curated by Neal Cox, faculty member in the SFA School of Art, who describes Rush as his mentor. "Though this is largely an opportunity to pay tribute, Kent's work alone merits exhibition," Cox said. "A pleasant blend of graphite drawings, prints and photographs, his works show how one idea can have multifaceted executions and maintain a distinct aesthetic transcending the single-media approach." The exhibition will include "mainly close-up images of odd urban infrastructure, much of it discarded or vestigial, photographed through the plastic lens of a toy camera," according to Cox. Rush spent his formative years absorbing the artistic, intellectual and political milieu of the San Francisco Bay Area during the 1960s, studying art, drawing and printmaking. He earned a B.F.A. from the California College of Arts and Crafts, a master's degree from the University of New Mexico where he studied art and lithography, and an M.F.A. from the University of Texas at Austin while teaching at the San Antonio Art Institute. After returning to California to show his work and teach for a brief time, he returned to San Antonio where he has spent the last 27 years making art and teaching at the University of Texas at San Antonio. "Specifically, he collects (on film) mundane objects and surfaces (primarily concrete) from urban and suburban sites and presents them in a monumental format," according to Cox.